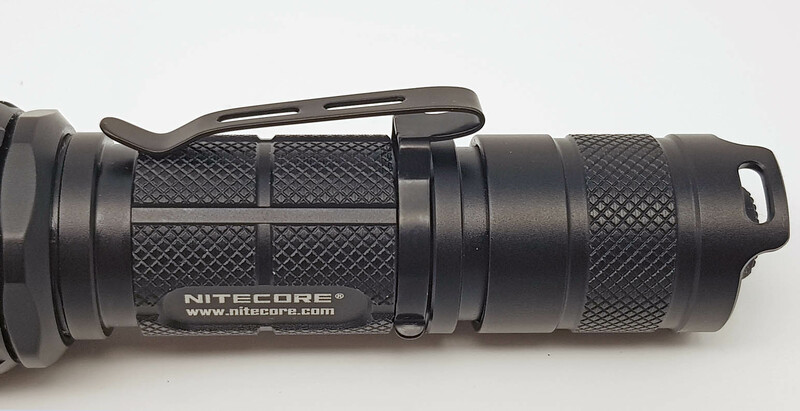 The Nitecore SRT7GT was sent to me directly by Nitecore for the review. 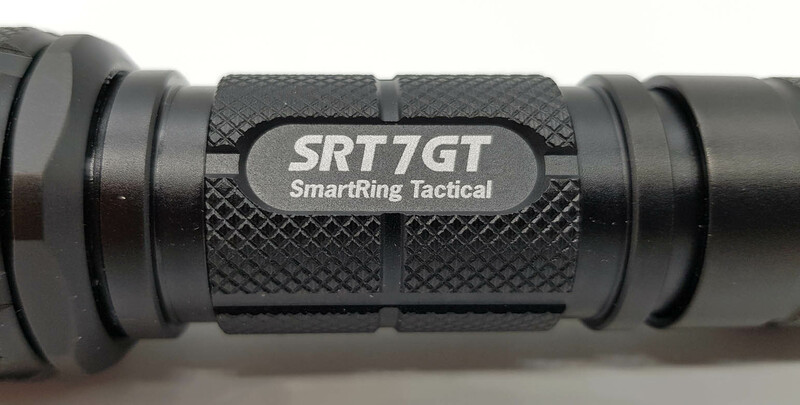 The Nitecore SRT7GT is a tactical flashlight from Nitecore's SmartRing Tactical line. 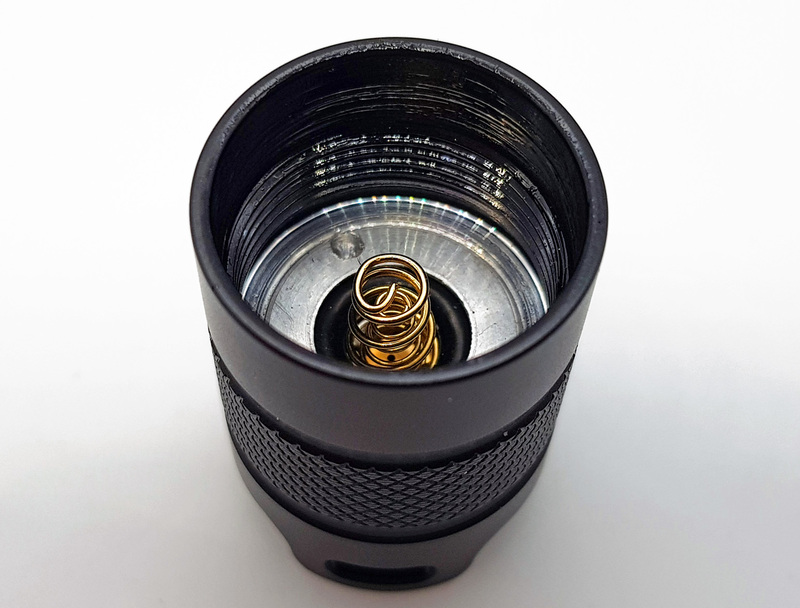 In this torch the UI is managed by a "3rd generation" rotating ring which allows to select the type of emitter that we intend to use and the level of light output. 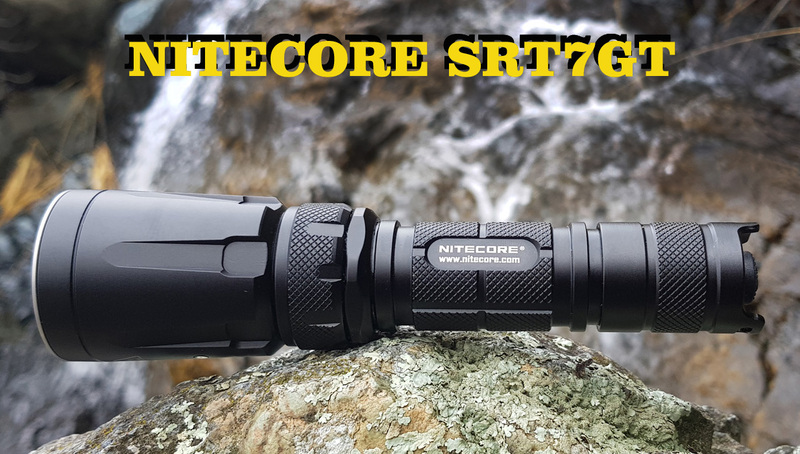 The Nitecore SRT7GT updates the SRT7 Revenge model a few years ago, implementing the Cree XP-L HI V3 led instead of the Cree XM-L2 T6 bringing the lumens from 960 to 1000. 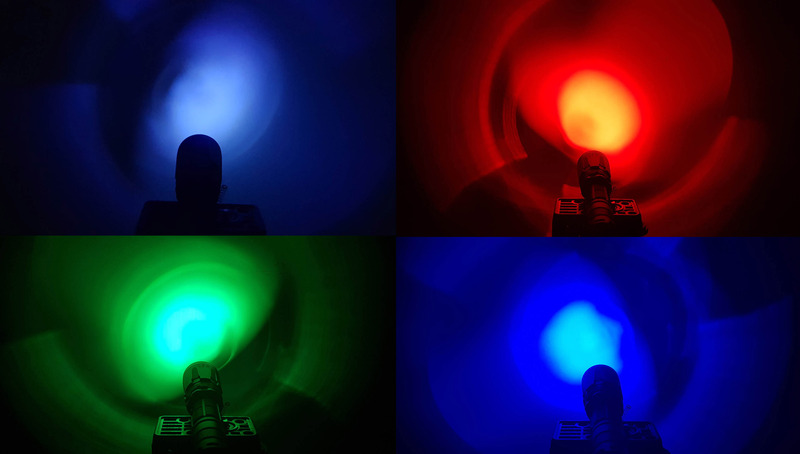 It also adds an ultraviolet emitter to the green, red and blue emitters . It also changes the color of the light on the head that turns blue instead of red. 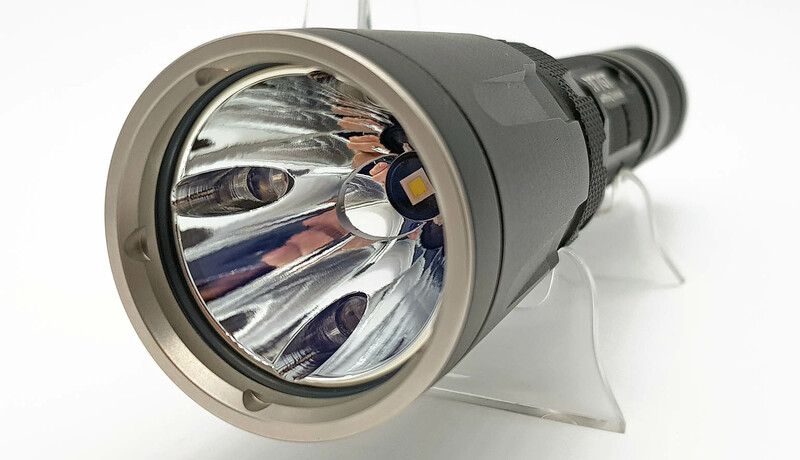 This torch is rated IPX-8 (waterproof and submersible up to 2 meters) and has a 1 meter impact resistance. 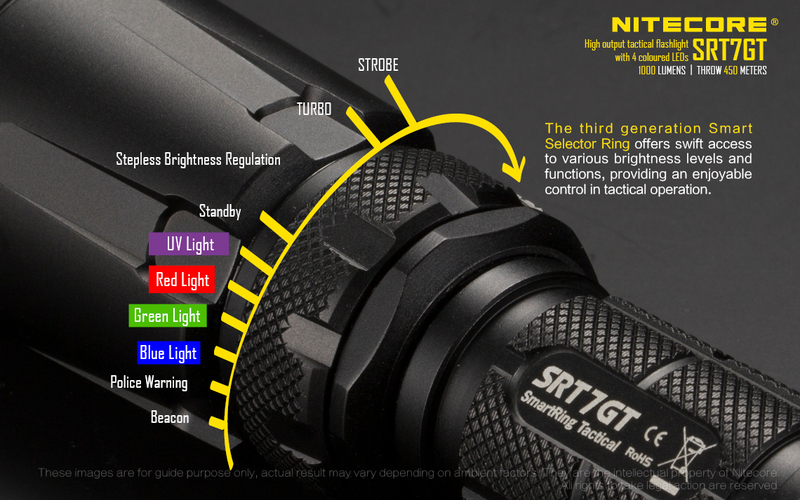 The Nitecore SRT7GT is designed especially for law enforcement, hunting and tactical applications. 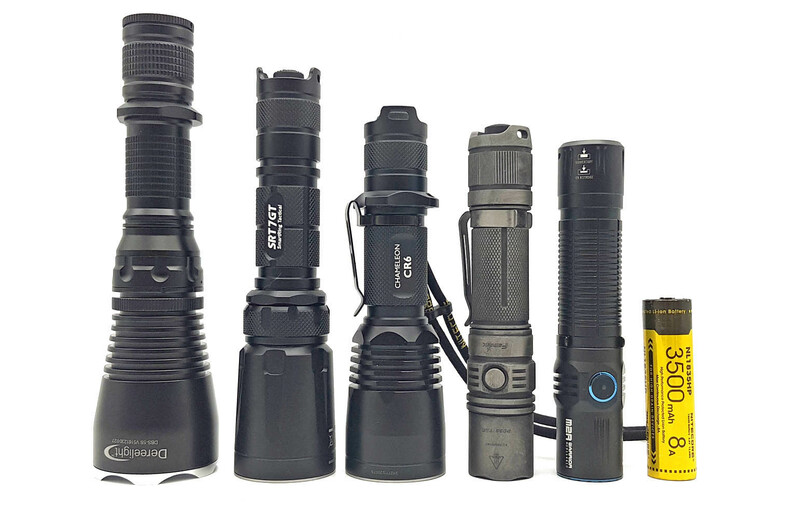 The Nitecore SRT7GT near other torches. As you can see from the picture the SRT7GT is long enough to be 1x18650. This is mainly due to SmartRing. 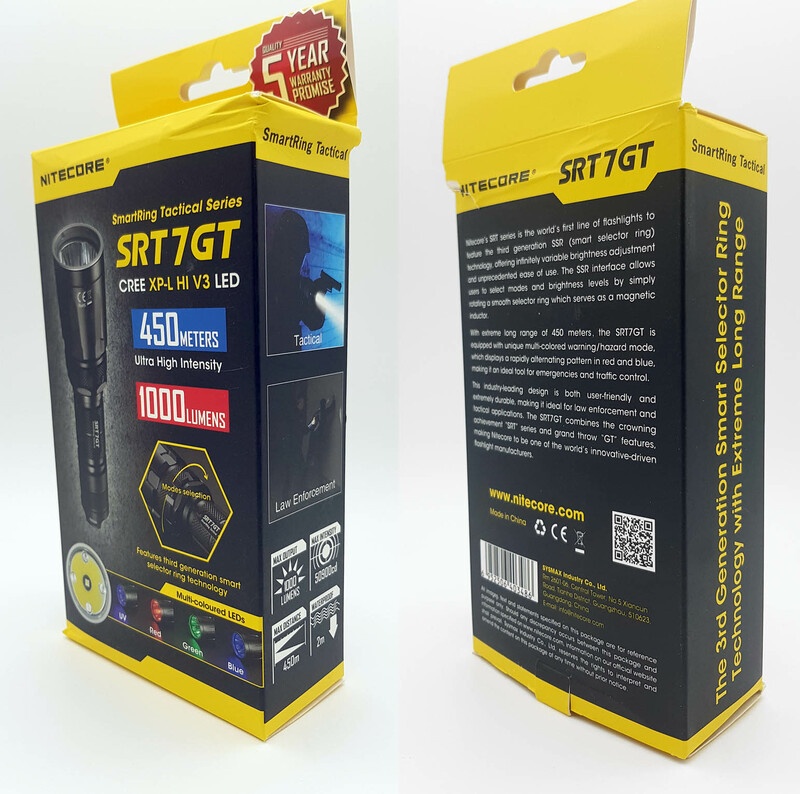 The Nitecore SRT7GT is sold in the classic yellow / black cardboard package. 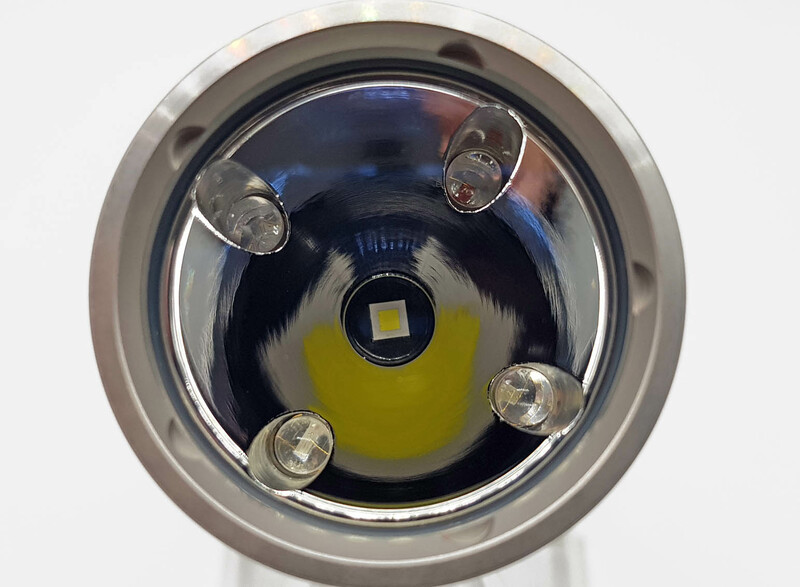 On the front side are highlighted the main features that distinguish this model as the CREE XP-L HI V3 LED, the 450 meters achieved by the light beam, the 1000 lumens of light output, the third generation of the SSR selector ring and LEDs multicolored UV, Red, Green and Blue. The new features of the SRT7GT are mentioned at the back. 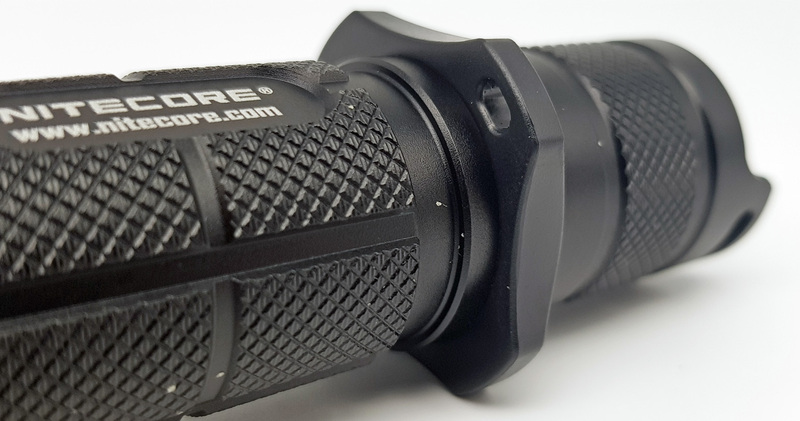 The Clip supplied with the Nitecore SRT7GT is as long as the central body and is made of stainless steel. It is possible to insert it in different ways in the SRT7GT. In the package we also find the holster. 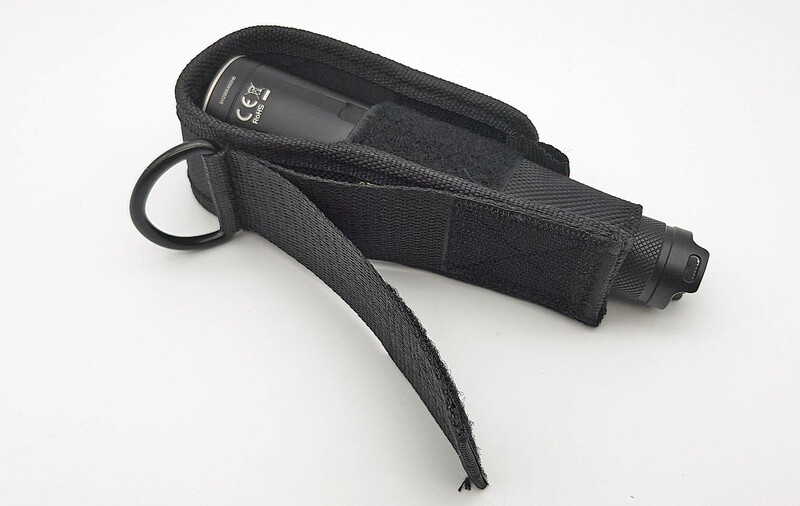 This specially designed for the Nitecore SRT7GT is in cordura with velcro closure. At the back there is a D-ring at the top and a double loop in the middle, one of which is a tear-off closure. 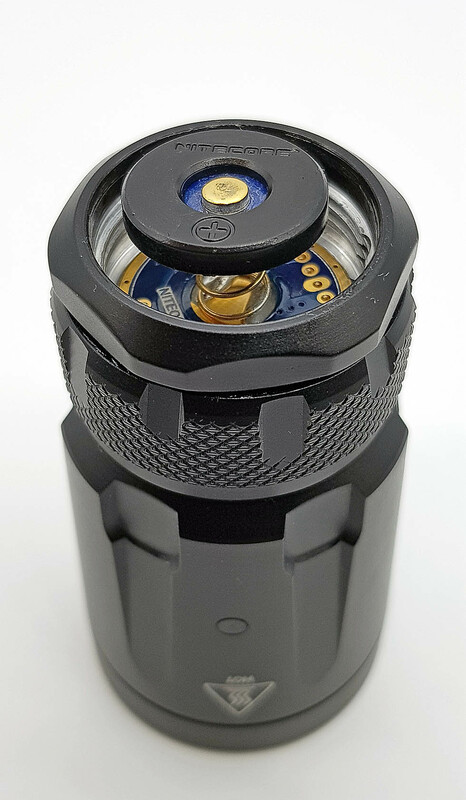 The Nitecore SRT7GT once inserted into the case remains stable without strange movements even if the tail remains out of the protection. 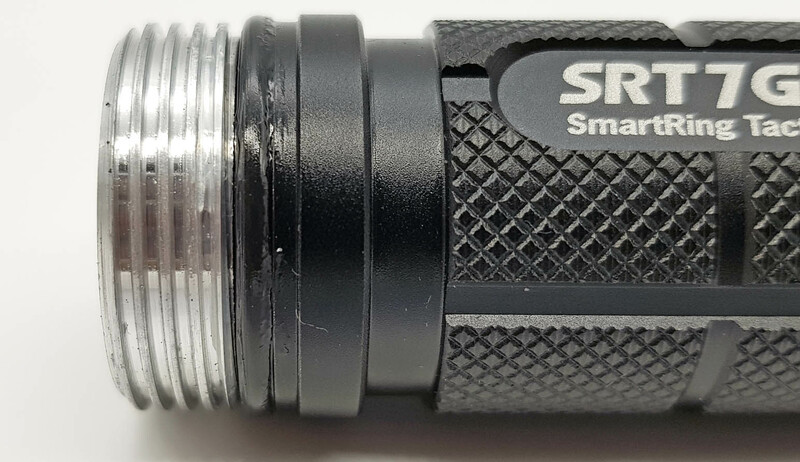 The anodization of the Nitecore SRT7GT is of an opaque black and the writings are a beautiful white on a black background that is clearly legible. 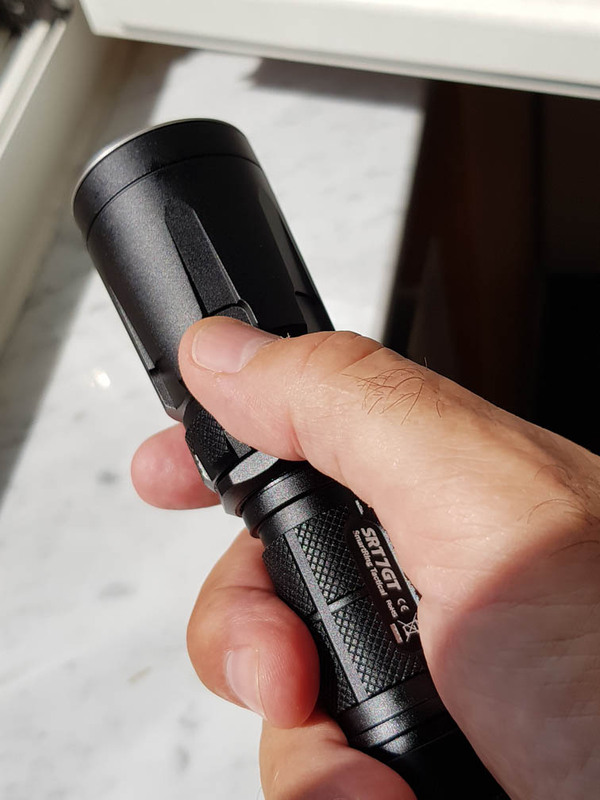 In the hands the Nitecore SRT7GT gives a sense of solidity and has an excellent grip due to the good ribbing on the body, in the tail and on the SmartRing. 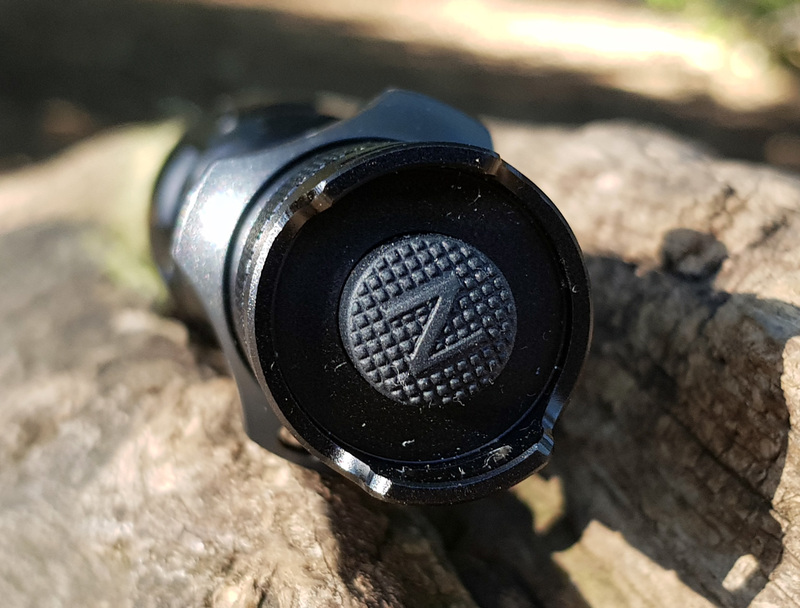 On the head of the Nitecore SRT7GT you can see the protective bezel of the anti-scratch optical glass with AR coating. 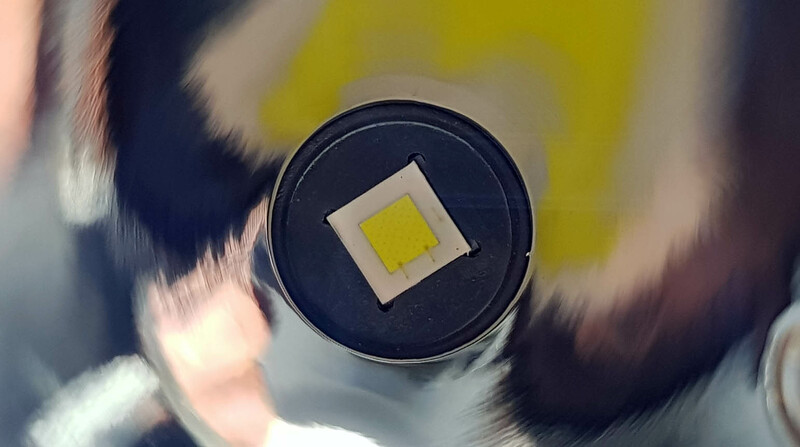 Under the SMO dish and deep in the center is the well-centered CREE XP-L HI V3 (cool white) that produces a bright hot spot. 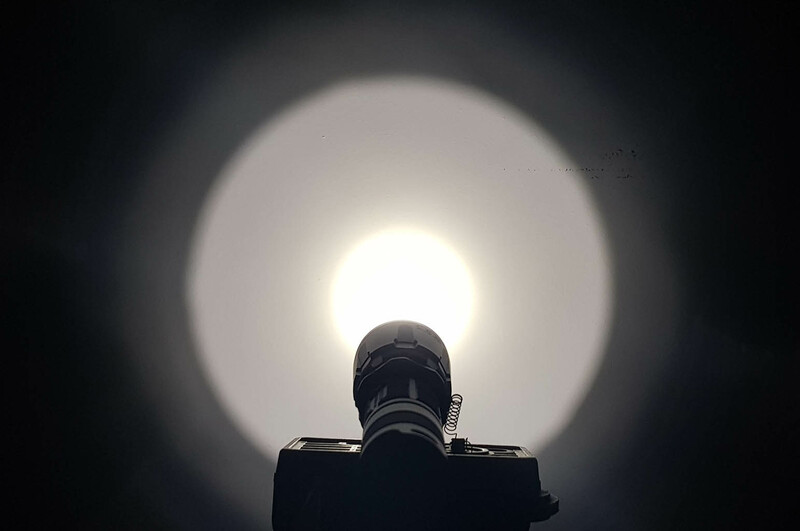 The UV, Red, Green and Blue emitters are inserted into the main reflector, bringing some slight artifact into the crown around the spot that is a beautiful white with no particular tendencies. The discrete head allows the SRT7GT to have a good shot. On the head there is a small blue LED indicator. When the tail switch is activated, the indicator flashes every two seconds if we are in standby. 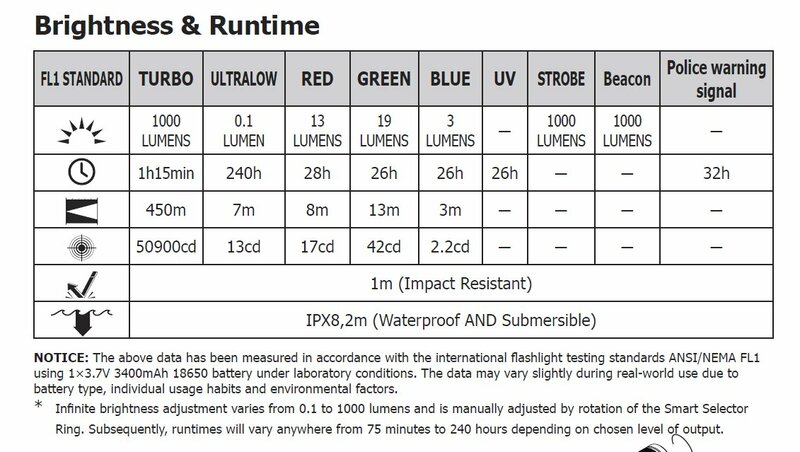 The LED flashes every 2 seconds even when the battery level is below 50% when the light is running. When the battery is almost empty, it flashes quickly and the remaining battery life, before remaining in the dark, is about twenty minutes. The fast flashing indicating low battery does not work properly if you are using batteries other than 18650. The SmartRing is well accessible to the touch by having toothed grooves of different sizes. No problem finding it in the dark or when using gloves. The control ring allows infinite adjustment of the brightness of the main LED and turns with the right force having a smooth adjustment. 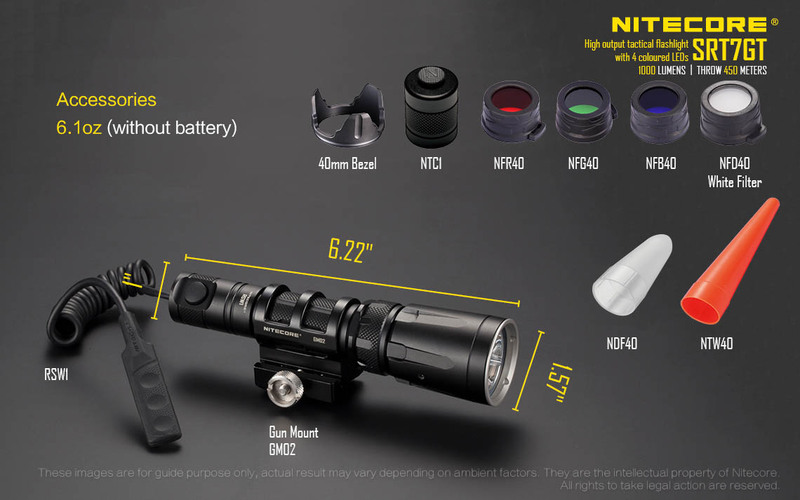 The Nitecore SRT7GT consists of three parts: Head, Body and Tail. The central body is short and has a good thickness. 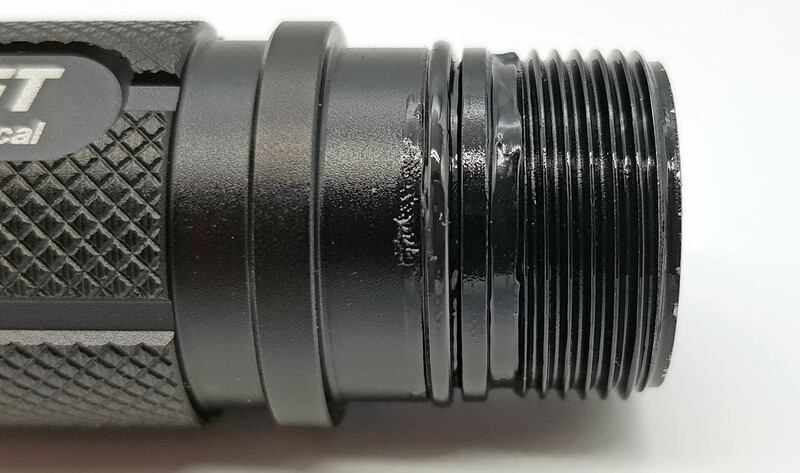 The screw threads are triangular cut and are anodized to the tail for the physical block (partial rotation of the tail cap). The body tube has square cut wires without anodisation towards the head. In my example the threads are well lubricated. 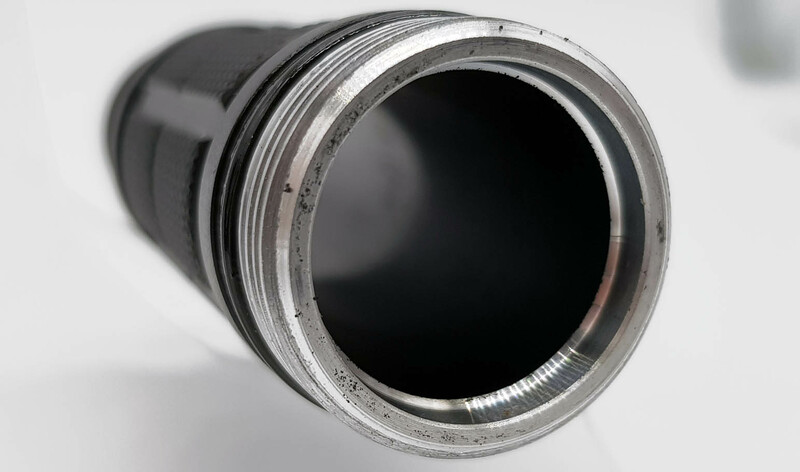 Both ends of the body have an o-ring against water infiltrations declared by Nitecore as IPX-8 (2 meters under water). 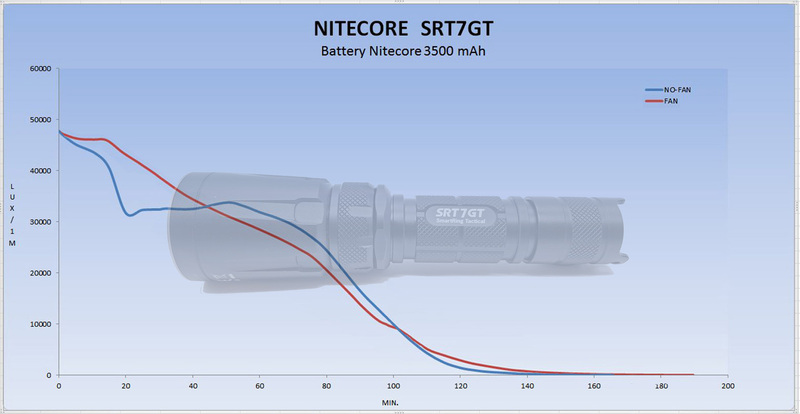 In tests carried out by me the Nitecore SRT7GT has never had problems plunging the torch into the water. For the contacts we have a spring with a button and a plastic ring for the protection of the reverse polarity and a double spring plated in the tail. 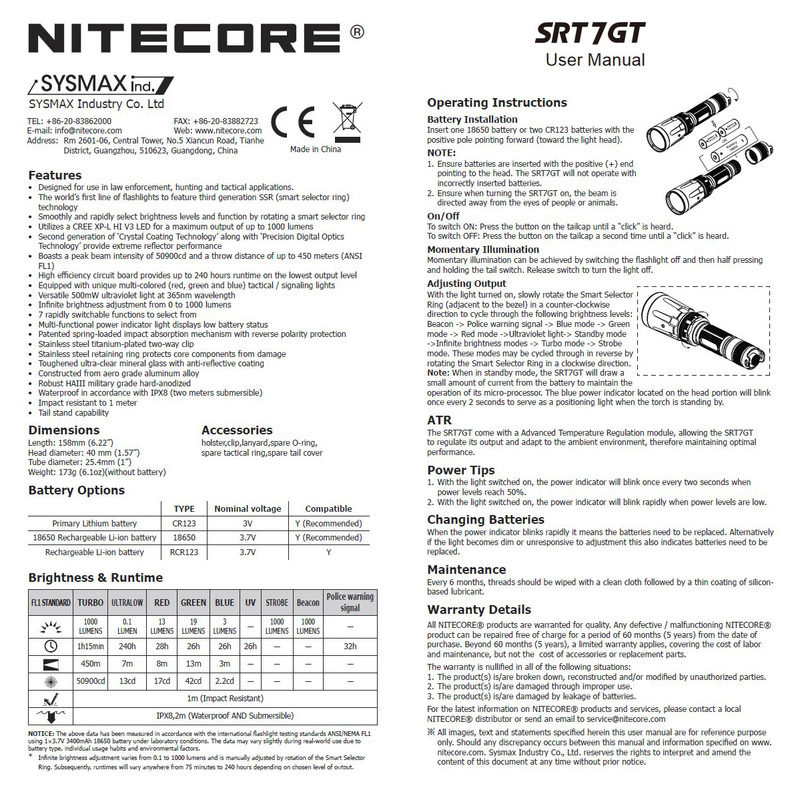 The Nitecore SRT7GT needs batteries with the button to work (button top). 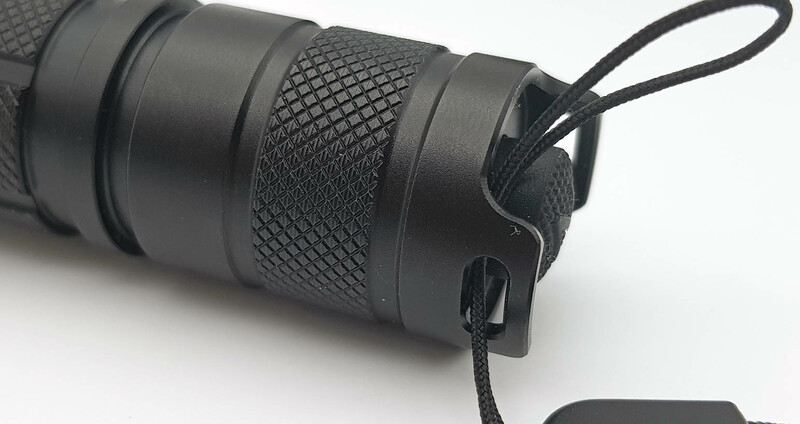 The Cigar grip tactical ring is made of plastic and can be added between the body tube and the tail cap. It has a hole for attaching the lanyard. The forward clicky switch on the tail cap needs moderate force to be operated. 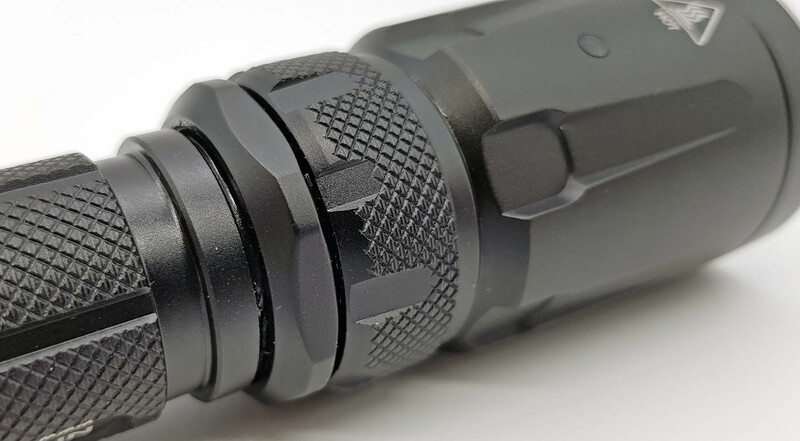 The Nitecore SRT7GT has a hole in the tail to put a lanyard and offers the tail stand capacity thanks to the particular U-shape of the tail. 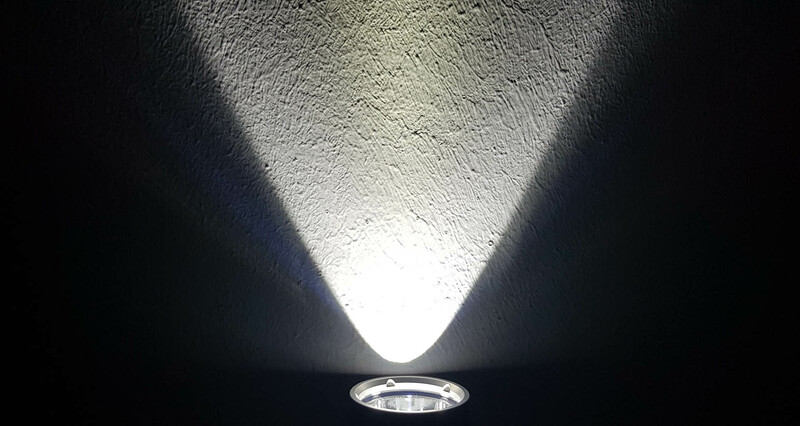 Momentary illumination can be achieved by switching the flashlight off and then half pressing and holding the tail switch. Release switch to turn the light off. 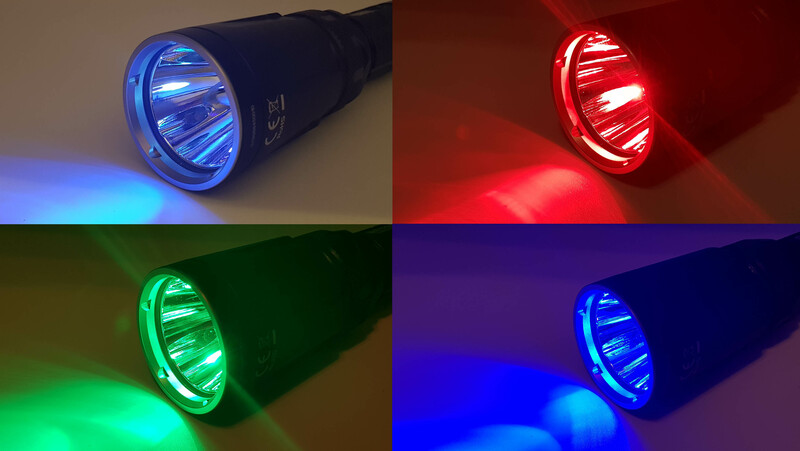 Beacon -> Police warning signal -> Blue mode -> Green mode -> Red mode ->Ultraviolet light-> Standby mode ->Infinite brightness modes -> Turbo mode -> Strobe mode. These modes may be cycled through in reverse by rotating the Smart Selector Ring in a clockwise direction. On each mode there is a ring lock. Unfortunately, the UV selector is located near the "Standby" mode. This can be misleading due to the weak output of the UV mode. I do not know any PWM effect visible on any level. 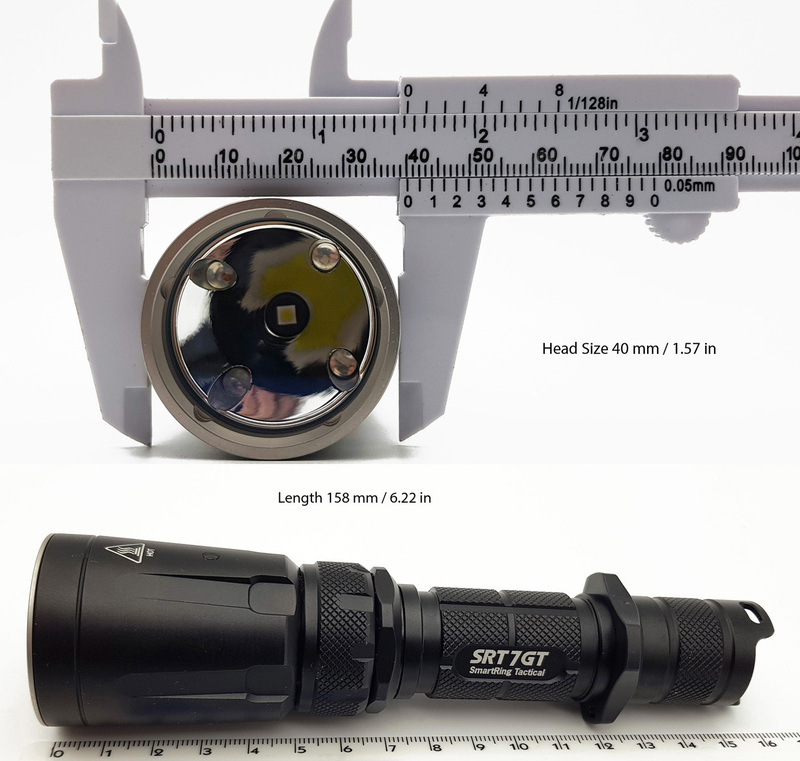 once every 2 seconds to serve as a positioning light when the torch is standing by. The SRT7GT come with a Advanced Temperature Regulation module, allowing the SRT7GT to regulate its output and adapt to the ambient environment, therefore maintaining optimal performance. Su ogni modalità si ha un blocco dell’anello. Purtroppo il selettore UV si trova vicino alla modalità "Standby". Questo può trarre in inganno visto la debole uscita della modalità UV. 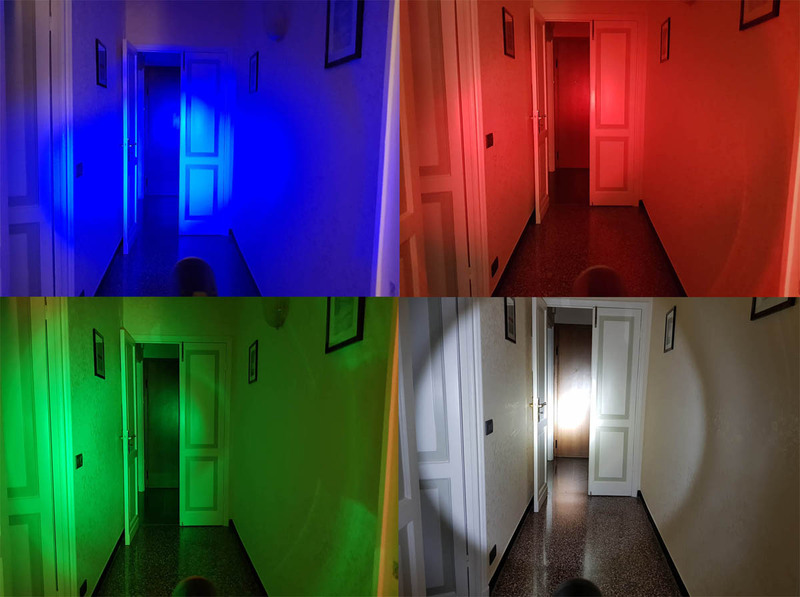 Non noto nessun effetto PWM su qualsiasi livello. 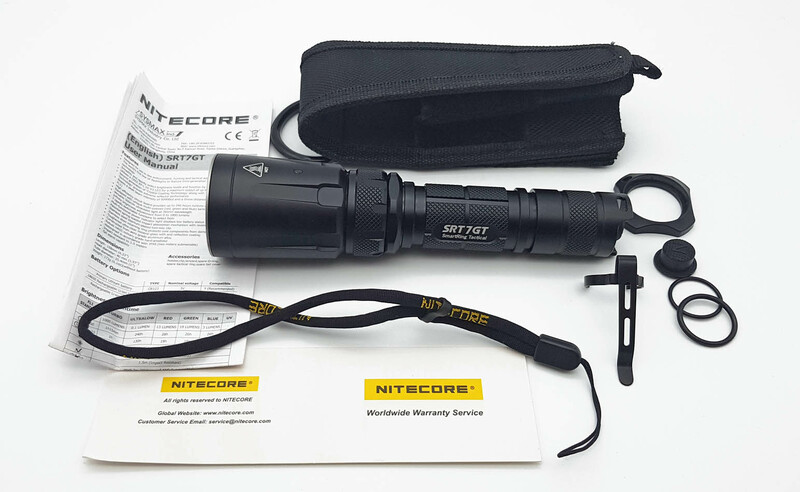 In general the Nitecore SRT7GT beam is well made with a tight hotspot of a not too cold white. The crown is quite bright and white with a tendency towards yellow towards the edges. 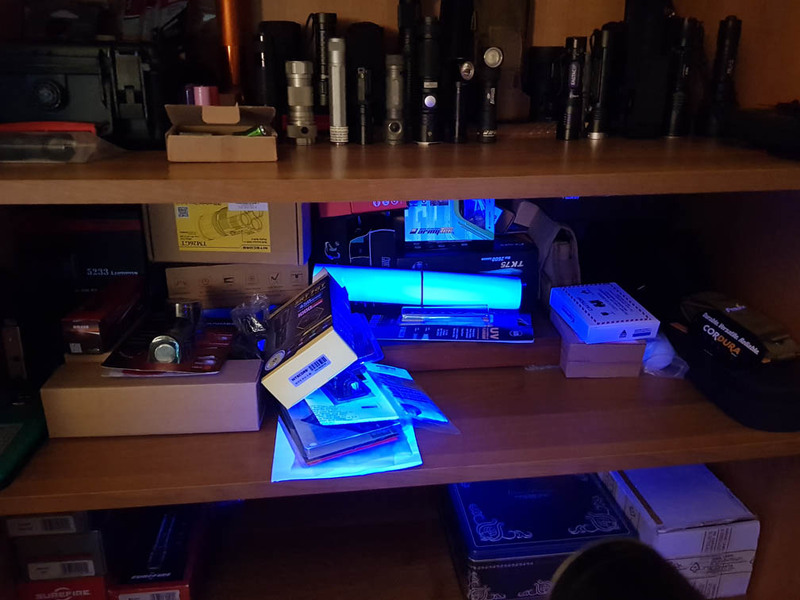 The auxiliary LEDs do not particularly affect the quality of the beam. The loose distance of the spill from the feet is about 100 cm. Different, of course, the quality of the beam of the auxiliary LEDs that do not pretend to illuminate in the distance. 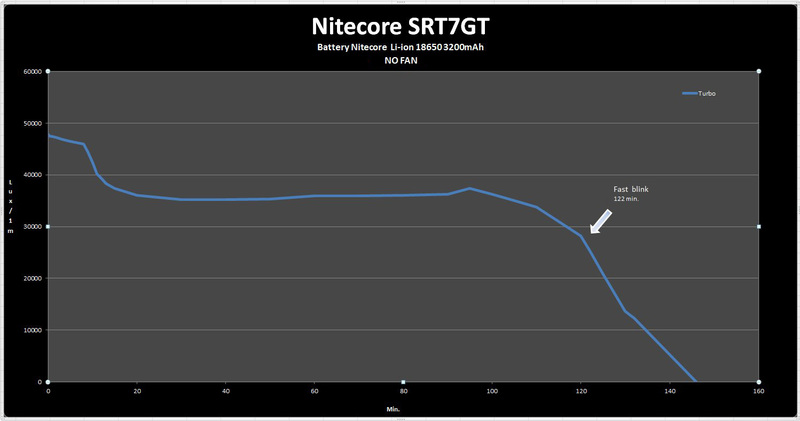 The runtimes were made with the Nitecore SRT7GT in TURBO mode using two different Nitecore batteries. I would like to point out that the values expressed by the graphs should be taken, above all, as a reference because they are made with different environmental means and conditions from those used in the laboratory. The power of the beam in candles is slightly lower than that declared by the house with both batteries used. The first test was made using a fully charged 3200 mAh (NL1832) Nitecore 18650 battery. The test was performed in a closed environment without forced ventilation. At minute 122 the flashing of the led became quick to indicate the near exhaustion of the battery. The second and third tests were made using a fully charged 3500 mAh 8A Nitecore 18650 battery (NL1835HP) with and without forced ventilation. 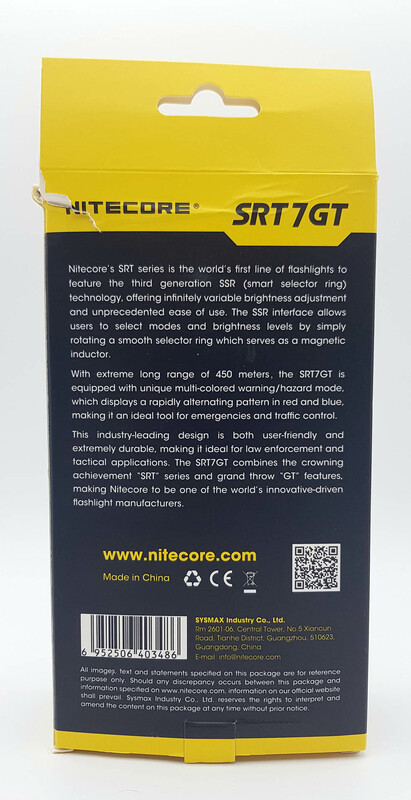 At the end of the test the battery marked on 2.60 v.
The Nitecore SRT7GT is still a excellent torch that has many functions including the main LED with infinitely variable adjustment and 4 auxiliary (UV, Red, Green and Blue), Police light, Beacon and Strobe. All this can be managed with a single magnetic selector "Smart Selector Ring". The SRT7GT grips very well with medium or large hands and thanks to the LED XP-L HI and the deep dish has a good shot and an exploitable spill. The excellent impermeability with the IPX8 degree of protection must also be taken into consideration. There is perhaps negative the low battery indicator works correctly only using 18650 batteries.